If you love Mr Van Halen, it's got his name written all over it. Not as vintage Eddie as we would have liked. Clad in shiny and matt black, like emo Peter Parker in Spider-Man 3, the new EVH 5150 Overdrive was designed in conjunction with the man himself, Eddie Van Halen. To get the best from the pedal, and hear the sound in Eddie's head, set your amp controls for a flat, clean tone and let the 5150 do the work. We put the pedal through its paces with an old Peavey Wolfgang, and once engaged, the overdrive sound is smooth yet doesn't sound processed. A tweak of the passive three-band EQ controls, in particular the bass and mid knobs, dials-in an addictive fat-sounding stack tone, and you can push the boost button for a small increase in saturation and compression. The vibe here is more modern Eddie than his famous 'brown' sound, but adding some phase and delay to the signal chain helps dial the years back. Elsewhere, the gate control, powered by MXR's clever Smart Gate circuitry, dials out unwanted noise caused by your pickups. Simple to set up, when you stop playing, the knob will glow yellow and hiss disappears. 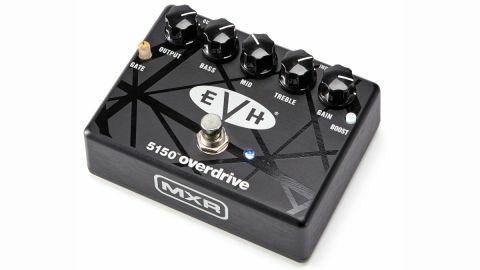 The 5150 Overdrive is easy to navigate and, in typical MXR fashion, is built like a tank. That gate is a fantastic selling point, too. We were hoping for a bit more vintage EVH, but as it stands, this is still an exceptional overdrive pedal.